Why is it that the bathroom is usually the smallest room in the house, and yet it seems to require so much “stuff?” It can be a challenge to keep all of your necessities at hand and still have your bathroom feel neat and uncrowded! When we re-did our ensuite bathroom last year, I chose a beautiful, stream-lined, minimalistic vanity to replace the old one. Mainly to make my bathroom look bigger. And yes it does “feel” bigger but I am seriously missing all the drawers my big old clunky vanity had. I have had to get very creative on how to organize and arrange all of my stuff without having it piled all over the vanity top. First, make a list of everything you need to have in your bathroom. Next, evaluate your space. What areas are empty or not being used? The back of the door? Above the toilet? The floor? And lastly, a trip to the dollar store. Seriously. I found all of these organizing tools at various dollar stores. This post contains affiliate links – which means if you click on them and buy something, I’ll earn a small commission. Thank you for your support! For my full disclosure policy, click here. I only share my ensuite bathroom with my husband but we still need a lot of towels handy. I use one for my face, body and hair. Plus we have our robes to hang. 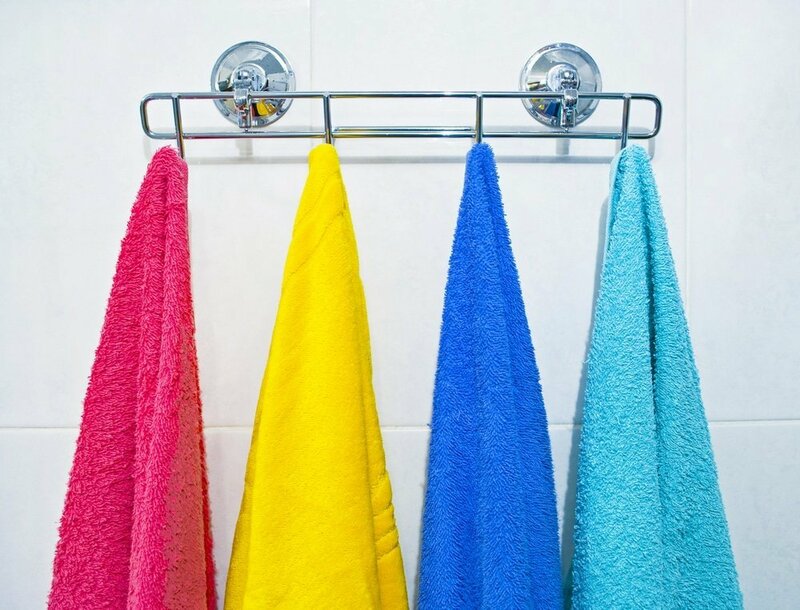 If you have several people using the same bathroom, you can easily store everyone’s towels in the same amount of space as a single mounted towel bar! We have an over the door rack and it easily holds everything. You can also use a decorative wall-mounted coat rack, or mount individual hooks right onto the wall. I found the perfect solution using the empty space above the toilet. 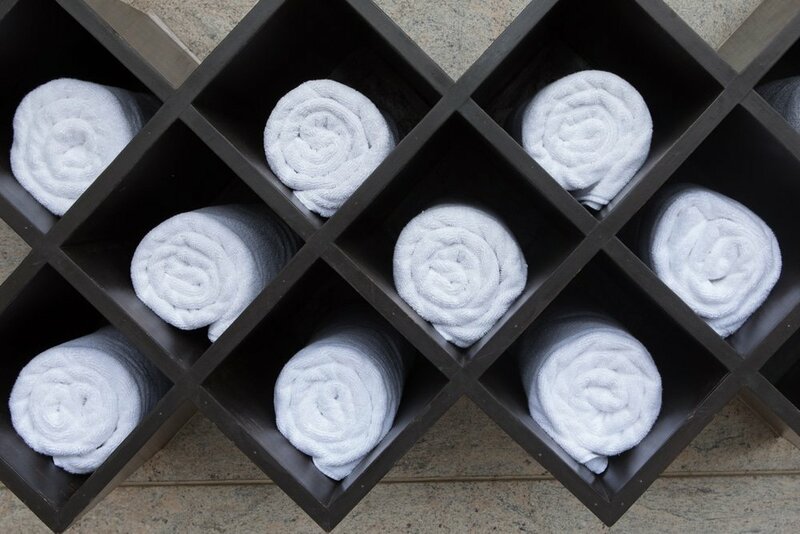 Did you know that rolled-up towels fit perfectly in a wine rack? There are attractive wine racks (mountable or free-standing), to complement nearly any decorating style! You are sure to find one that will look nice and fit whatever size space you have available. 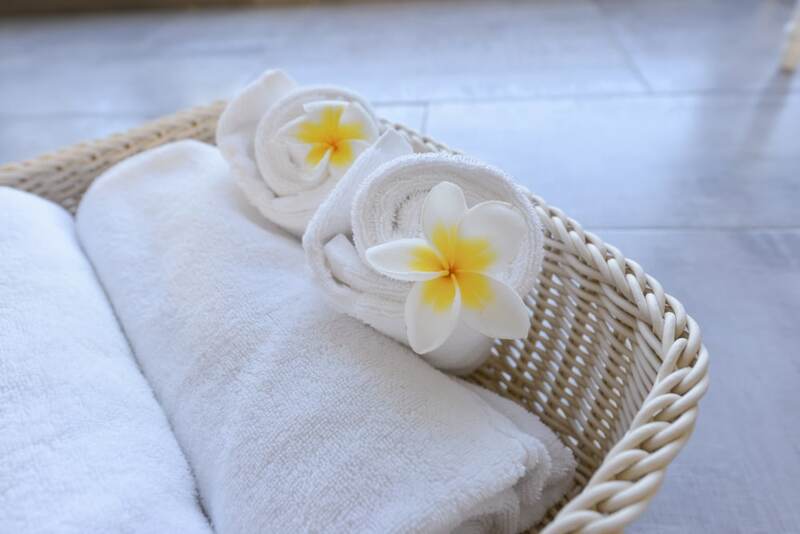 Even if you don’t go with a wine rack for your fresh towels, rolled towels will take up less space – and look nice – sitting in a basket (see #14 below) or even on the shelf. 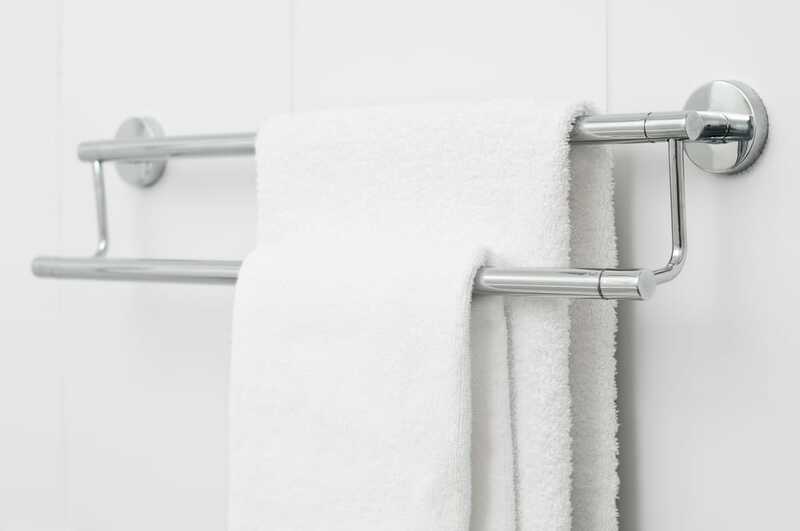 This double towel rack is one item that I did splurge on and did not buy at the dollar store. I love that it holds our big bath towels. We mounted it right over the heating vent so our towels are always dry and nice and toasty in the winter when we go to use them. You could create the same effect by buying two towel racks from the dollar store with different arms lengths. As far as I am concerned, you can never have too many towel bars. 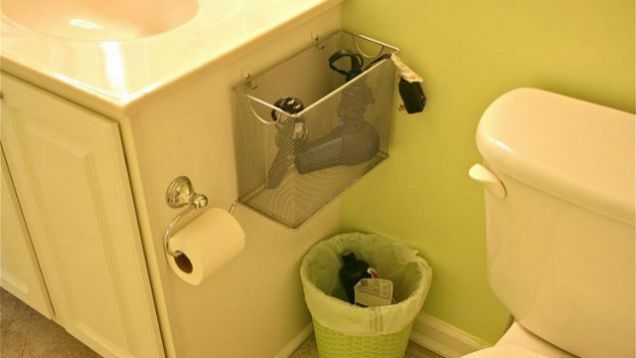 Try mounting an extra towel bar or two. “Where?” you might ask. The back of your bathroom door probably has enough space to mount two towel bars – one near the top (but within reach) and the other about half-a-towel’s length below it. Above the laundry hamper and beside the vanity are always good places too. 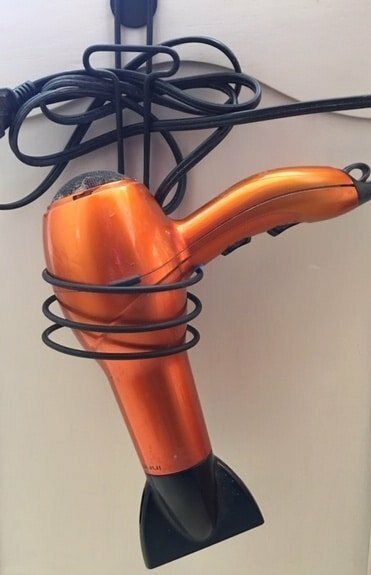 Hair dryers, curling irons, and hair straighteners can be a pain to store, especially in a small space. Mounting hooks on the inside of your vanity door can keep your hair tools (and their unsightly cords) close at hand, but out of sight. You can hang tools and brushes directly on hooks fastened to the inside of a vanity door or store them in a wire basket just the right size to contain them. The dollar store even has specific organizing tools for hair appliances, like pictured above. Pro tip: using adhesive hooks will lower the risk of damaging the face of your vanity. 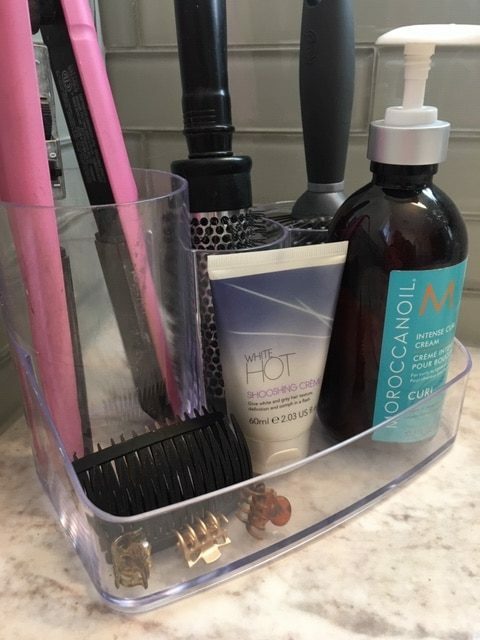 An upright magazine rack can be just the right size to keep curling irons, hair straighteners, brushes, or tall bottles of hair product nice and neat in a small space – and the cords won’t be visible either! Magazine racks can be found in as simple or decorative a style as you like. 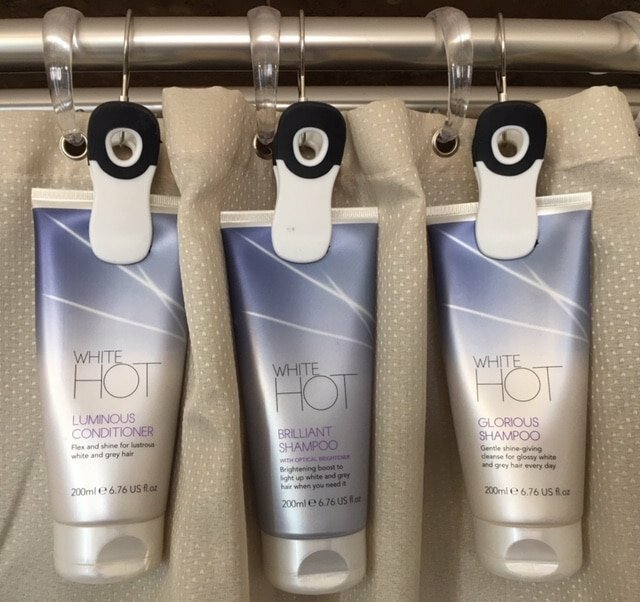 Mount them to the side of your vanity as pictured above, keep them on your counter or store them in the vanity below your sink. We’ve all got those bathroom items that we don’t use daily but need to keep on hand. You know what I’m talking about – cleaning supplies, extra toilet paper, razors, and toothbrushes, and that big bottle of fancy bubble bath we only use every once in a while. 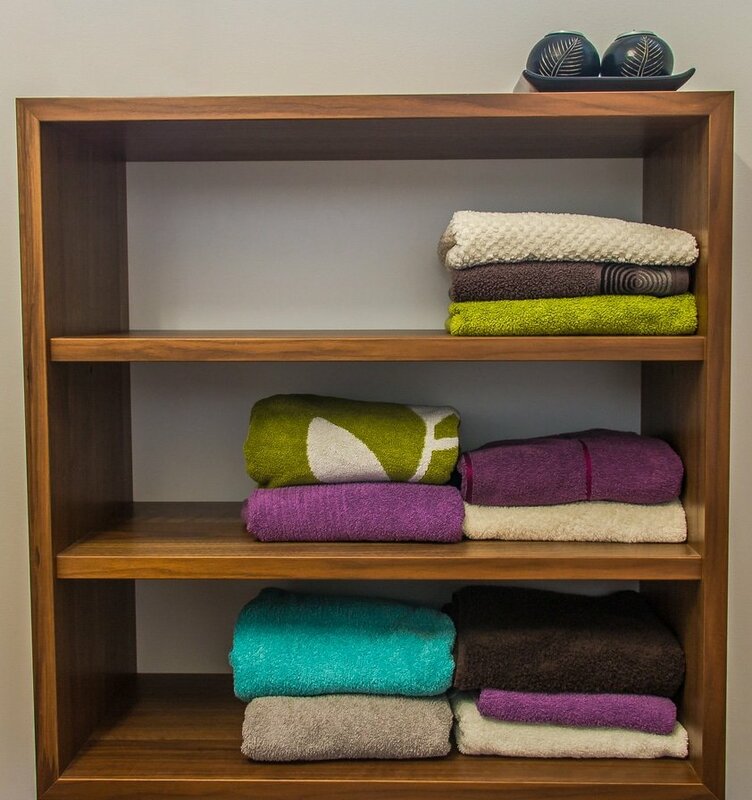 High shelves or on top of vanity mirror cabinets can be the perfect spot for these items. Don’t be afraid to get creative with the location. The empty space above a door or shower stall are ideal. 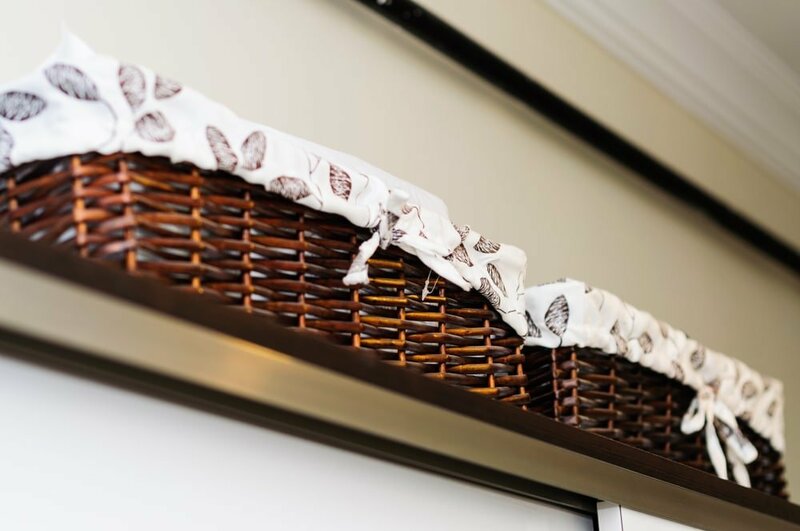 Use a few decorative baskets or plastic bins to keep everything organized up there! Mount floating shelves anywhere you have a patch of free wall space! They come in a wide variety of lengths, so you can make one work nearly anywhere. They come in singles or as a group. Pro tip: Think vertically! Having a few floating shelves neatly “stacked” on the same wall creates a streamlined look with all kinds of storage potential! Small shelves that nestle into a corner are a spectacular way to squeeze out a little extra storage space. Use your corner space on the floor or on the wall. If you have the room, consider mounting more than one shelf in the same corner! Corner shelves are great spots to store smaller items or even add a photo or decorative knick-knack or two. There are endless options for getting creative and expressing your personal style with this idea! Baskets or crates mounted sideways (open side facing out) become unique shelves. Hanging baskets “right side up” from wall hooks is another option. Make use of that little bit of space between your sink and mirror! 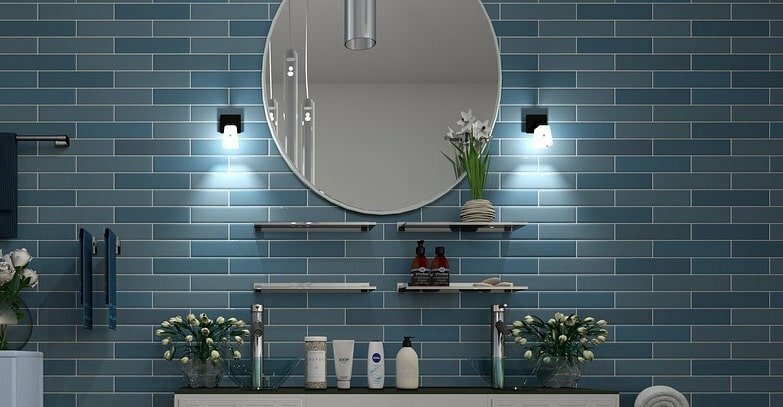 Mounting a ledge-style shelf (or hanging a mirror that has a shelf attached) leaves space for some of those toiletries that you use every day – perfume, electric toothbrushes, moisturizer, etc. Don’t underestimate the usability of these shallow shelves. Most toiletries and small bathroom items should be small enough to fit. Need tips to super clean your bathroom from top to bottom like a pro? Click here. 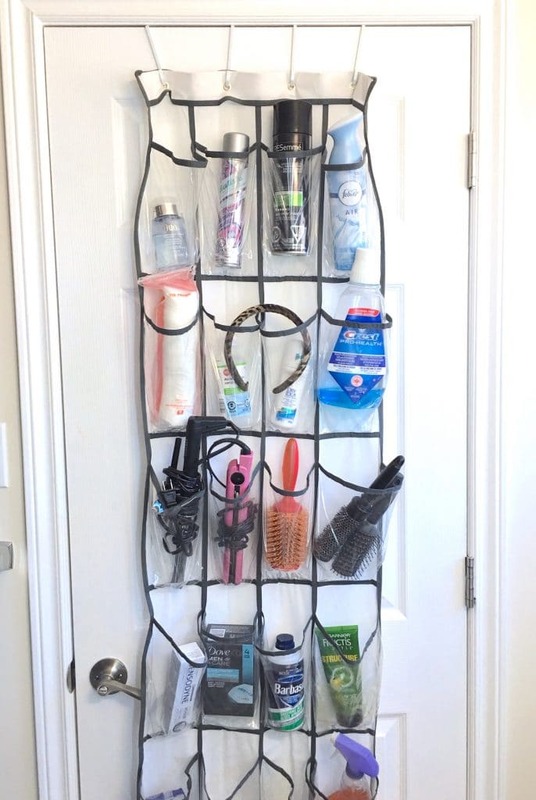 A hanging shoe organizer can be hung off the back of the bathroom door to keep all of your hair tools and products easily accessible, and each in its own special spot! A hanging jewelry organizer can do the same thing for your makeup. Get creative! You can find great organizers in the office and kitchen sections of the dollar store. This plastic drawer organizer is perfect for organizing all the small things. It makes it super easy for me to put things back in their proper spot, plus when it gets dirty, I throw it in the dishwasher! While you are in the office section of the dollar store, have a look at pencil and pen holders. They are a great way to organize your vanity counter top. Group like items together. I have all my hair products and accessories organized in one convenient spot. Is there a part of the floor (between the base of a pedestal sink and the wall, for instance) that your feet are unlikely to ever touch? Then it’s the perfect spot for an attractive storage basket or box! Small items like beauty products, essential oil bottles, or nail polish can be attractively organized and within easy reach in a small spice rack. 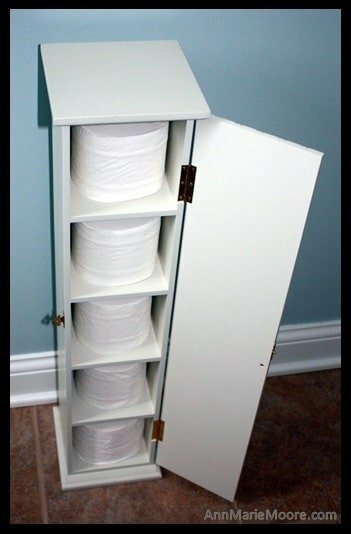 An upright CD storage tower can be slid into that small space next to your toilet – keeping the toilet paper as conveniently close as can be! Do you have a lot of boys in the house? Check out this post with ways to get rid of the porta-potty smell and urine splash. 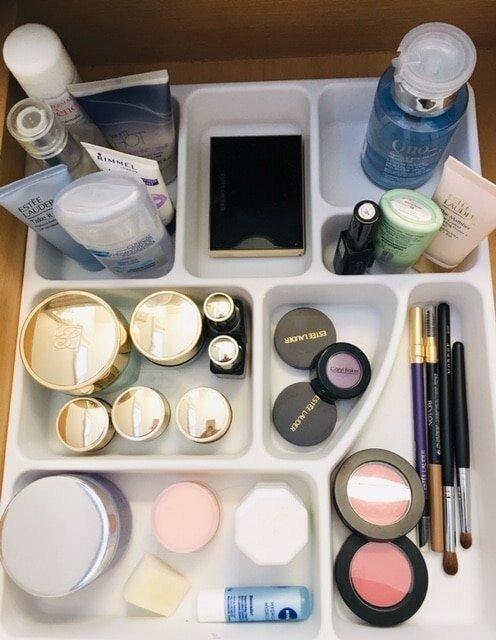 If there’s any “dead space” inside your vanity, you’re missing out on more out-of-sight storage! Adding a tension rod for hanging items, a pull-out drawer, or even a lazy susan can dramatically increase how much you can keep in there! When counter space is limited, vertical storage solutions are your best friend. Think outside the box – what might suit your unique style best? A silver tiered cake tray? A wooden revolving spice rack? Don’t be afraid to get creative here! 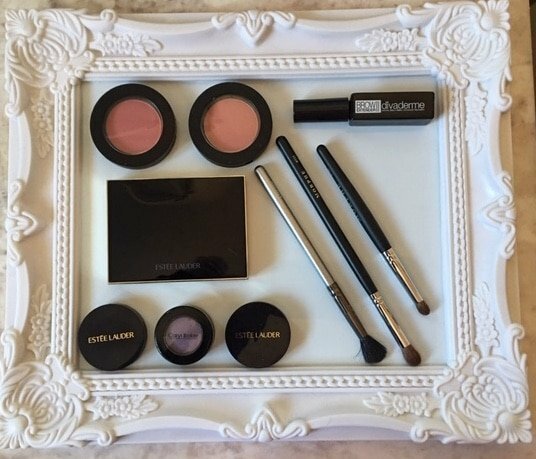 Check out this magnetic board that I picked up to keep my most used makeup and accessories handy. Buy little magnets at the dollar or craft store and use a glue gun to attach them to the small items you use on a daily basis. The bonus with this magnetic board is that you can paint it to match your decor. 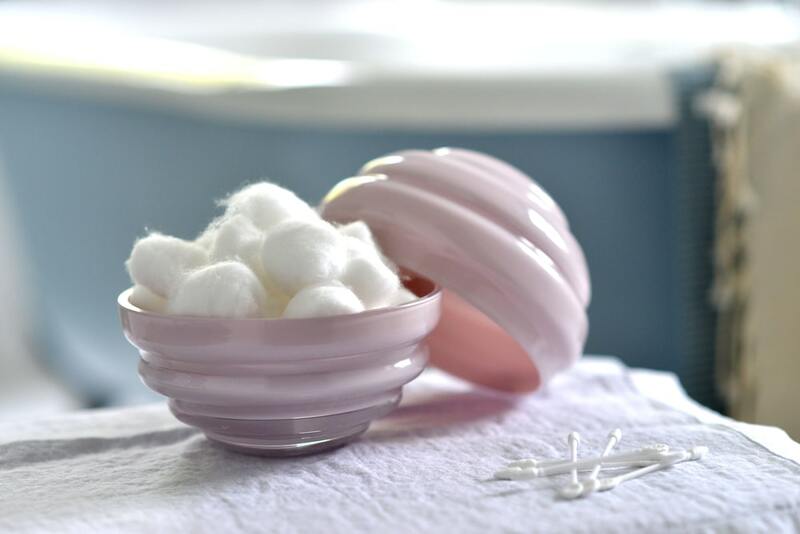 What about those items that come home in bulky packaging, like cotton swabs and cotton balls? Fill a box, jar, or another container small enough to fit on your shelf or counter, and store the rest somewhere else (see some of the previous tips for ideas!). A votive candle holder is the perfect size for a small bundle of cotton swabs or an (unpackaged) package of hair ties. I picked up some dollar store clips and another set of shower curtain hooks and voila!, the perfect spot to hang your loofah and body wash. You can also hang a couple of waterproof baskets that can hold your shampoo and conditioner! 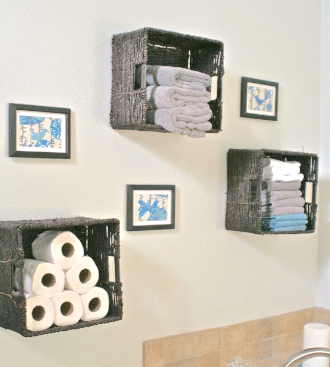 As you can see, a small bathroom doesn’t have to be cluttered and disorganized! Give a few of these pro tips a try! Even if your bathroom is tiny, it can be a stylish and totally functional space!